UPDATED Sales for 2018! Read the latest, "3 Valentine's Day Diamond Deals for under $3k"
Planning a proposal this Valentine’s Day? 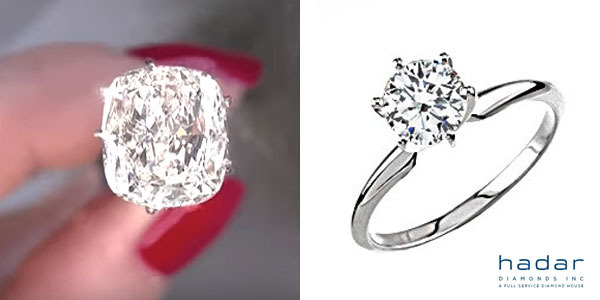 Do you want a pretty, natural diamond while still saving up for other exciting purchases, such as a home, a car, or other luxuries you and your lovely can share together? Shop the Valentine’s Day Diamond Sale 2016 for the prettiest diamonds at the best price anywhere you shop! 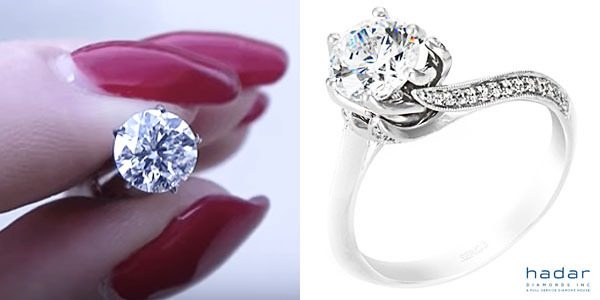 Whether you are looking to stay within a $5,000 or a $5,000,000 price range, Hadar Diamonds can help! For the regal woman who appreciates elegance and grace, we recommend the 1.10 carat Oval Brilliant Laser Drilled Diamond paired with the 14K “The One” Classic Solitaire Engagement Ring. 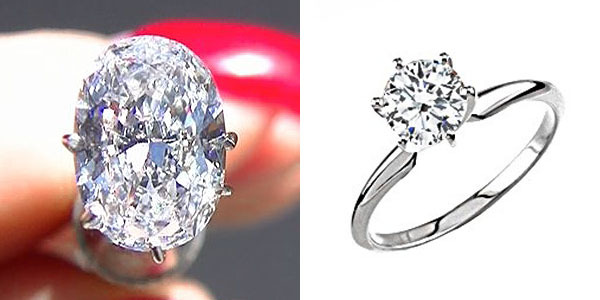 With its top D color, SI1 clarity and exceptional layout, the 1.10 carat Oval is meant to impress at a pleasing price. Paired with the popular “The One” Classic Solitaire, the statement is fit for royalty. Actual diamond video available (below). 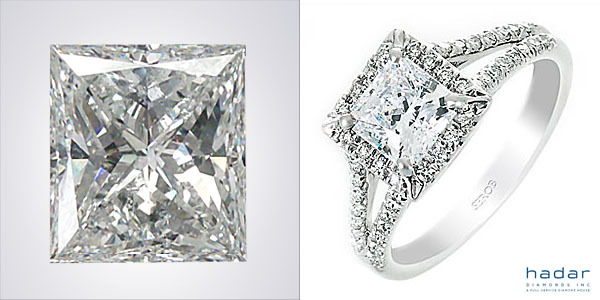 For under $4,000 she can flaunt a pretty Princess Cut Halo Engagement ring with high levels of fire and sparkle. The 1.02 Princess Cut clarity enhanced diamond is eye-clean when viewed by the unaided eye and boasts Very Good symmetry and polish. Set in the 14K gold Genevieve Halo Engagement Ring setting, the 1.02 will be a gorgeous addition to your angel’s hand. For the romantic who appreciates unique beauty, we recommend the 1.01 carat Round Brilliant Laser Drilled diamond paired with the 14K Asymmetrical Solitaire Engagement ring. The 1.01 carat round brilliant is Ideal cut with top-tier E color, and a highly desirable Triple Excellent grade on cut, polish, and symmetry for fire and sparkle. Paired with the Asymmetrical Solitaire Engagement ring in 14K gold, the 1.01 carat center diamond will be complemented with a cascade of diamonds along the curvy band of this ring. Actual diamond video available (below). 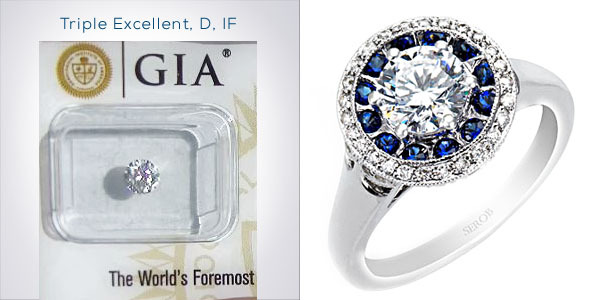 #4: .50 ct GIA Certified, D, Flawless with a Double-Halo Diamond and Sapphire Ring! WOW her with a .50 carat Round Brilliant, GIA Certified Round Brilliant natural HPHT diamond set in a stunning Double-Halo Engagement Ring with diamonds and sapphires! This .50 carat Round Brilliant Diamond has everything you want in a diamond, including a top D color, Internally Flawless clarity, and a Triple Excellent cut, polish, and symmetry grade. The appearance of its size will be magnified when it becomes the centerpiece of the designer 14K gold Double-Halo Engagement Ring set with diamonds and sapphires. Perfect for the woman who wants everything in a natural, gorgeous diamond engagement ring for under $5,000! Sparkle, shimmer, and shine with an impressive size for under $5,000! The 1.51 carat Cushion Cut Laser Drilled Diamond boasts magnificent brilliance with a medium rectangle pillow shape. Ideal for a sparkling Valentine’s Day Diamond Engagement Ring, it is perfect for a center showpiece when set in the 14K “The One” Classic Solitaire diamond engagement ring. Contact Hadar Diamonds to inquire about Valentine's Day Diamond Prices. Prices above valid through 2/04/16.